• As of 2010–2014, the global annual rate of abortion for all women of reproductive age (15–44) is estimated to be 35 per 1,000, which is a reduction from the 1990–1994 rate of 40 per 1,000. • Women in developing regions have a higher likelihood of having an abortion than those in developed regions—36 vs. 27 per 1,000. 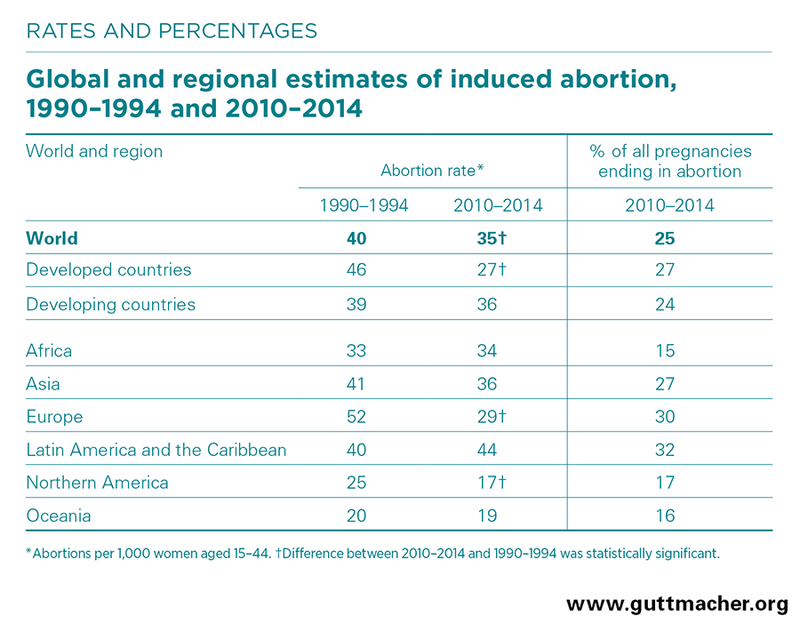 • Between 1990–1994 and 2010–2014, the abortion rate declined markedly in developed regions, from 46 to 27 per 1,000, but remained roughly the same in developing regions. • The annual number of abortions during the period fell in developed regions, from about 12 million to seven million; in contrast, the number increased in developing regions, from 38 million to 49 million, although this change mainly reflects the growth of the reproductive-age population. • The proportion of abortions worldwide that occur in developing regions rose from 76% to 88% between 1990–1994 and 2010–2014. • The highest annual rate of abortion in 2010–2014 was in the Caribbean, estimated at 59 per 1,000 women of reproductive age, followed by South America, at 48. The lowest rates were in Northern America, at 17, and in Western and Northern Europe—at 16 and 18, respectively. • Across all world subregions, Eastern Europe experienced the largest decline in its abortion rate, from 88 per 1,000 in 1990–1994 to 42 per 1,000 in 2010–2014, which corresponded with an increase in access to modern contraceptives following the dissolution of the Soviet Union. • As of 2010–2014, the overall abortion rate in Africa is 34 per 1,000 women. Subregional rates range from 31 in Western Africa to 38 in Northern Africa; abortion rates in these subregions have changed little or not at all since 1990–1994. • In Latin America and the Caribbean, subregional abortion rates range from 33 in Central America to 48 in South America to 59 in the Caribbean. The overall regional rate has hardly changed since 1990–1994. • In Asia, the average abortion rate is 36 per 1,000 women. Most subregional rates are close to this figure; Central Asia is higher at 42. The regional rate has changed little since 1990–1994. • Induced abortion is medically safe when WHO-recommended methods are used by trained persons, less safe when only one of those two criteria is met, and least safe when neither is met. • Of the 56 million induced abortions that took place each year during 2010–2014, an estimated 25 million (45%) were unsafe. In all, 55% of abortions each year were safe, 31% were less safe, and 14% were least safe. • Abortion tends to be safer where it is broadly legal than in more legally restrictive settings. It also tends to be safer in countries with a higher gross national income. • Of the world’s 1.64 billion women of reproductive age, 6% live where abortion is banned outright, and 37% live where it is allowed without restriction as to reason. Most women live in countries with laws that fall between these two extremes. • Between 2000 and 2017, 33 countries expanded the circumstances under which abortion is legally permitted. • Abortion rates are similar in countries where abortion is highly restricted and where it is broadly legal. The abortion rate is 37 per 1,000 women in countries that prohibit abortion altogether or allow it only to save a woman’s life, and 34 per 1,000 in countries that allow abortion without restriction as to reason—a difference that is not significant. • High levels of unmet need for contraception and of unintended pregnancy help explain the high levels of abortion in countries with restrictive abortion laws. • The safety of induced-abortion services has improved over the past decade with widening legality and an increasing reliance on medication abortion. However, the WHO safety guidelines mentioned above are often only partially met in legally restrictive settings, resulting in less-safe procedures. Even so, this is still an improvement over least-safe procedures. • Treatment of complications has also improved with updated guidelines for postabortion care. Yet, complications from unsafe abortions are still common in developing regions where abortion remains highly restricted. Estimates for 2012 indicate that 6.9 million women in these regions (excluding Eastern Asia) were treated for complications from unsafe abortions, corresponding to an annual rate of approximately seven women treated per 1,000 women aged 15–44. However, estimates (based on a 14-country sample) suggest that, on average, 40% of women who experience complications never receive treatment. • In 2014, the annual cost of providing postabortion care in developing countries was US$232 million. • According to recent estimates, at least 8% of maternal deaths worldwide are from unsafe abortion; at least 22,800 women die each year from complications of unsafe abortion. • Almost all abortion-related deaths occur in developing countries, with the highest number occurring in Africa. • As of 2010–2014, an estimated 99 million unintended pregnancies occur each year worldwide. Of these, more than half (56%) end in abortion. • Between 1990–1994 and 2010–2014, the global rate of unintended pregnancy declined from 74 to 62 per 1,000 women as a result of increased use of modern contraceptives. 2. Guttmacher Institute, Adding it up: investing in contraception and maternal and newborn health, 2017, Fact Sheet, New York: Guttmacher Institute, 2017.